COSTEP-CT Coordinated Statewide Emergency Preparedness – Connecting Connecticut's first responders and cultural heritage organizations during emergencies to protect and save our cultural treasures. The 1856 loss of the ancient white oak tree known as the “Charter Oak” in a severe storm sparked an outpouring of public grief in the state. 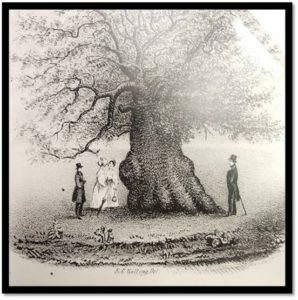 The tree is said to have been used by colonists to hide Connecticut’s first charter from confiscation by royal authorities in 1687. Whether true or not, the story served as a symbol of Connecticut’s struggle for freedom that has resonated through the centuries. Photograph: The Charter Oak from a view taken for Hon. I. W. Stuart on the morning of its fall, Aug. 21st 1856. Lithograph by E.B. and E.C. Kellogg. Courtesy of the Hartford History Center, Hartford Public Library.